Anytime you can treat, prevent, or even eliminate a common modern medical problem with food or herbs, it’s exciting. Largely because we are so bombarded with toxic formulas for everything form a skinned knee to an upset stomach, these natural treatments are a breath of healing fresh air. One of the latest studies affirming the benefits of the easily-found ginger root indicates it may only take about a quarter-teaspoon of the food each day to significantly reduce inflammatory markers associated with Type 2 diabetes. The American Diabetes Association estimates some 25.8 million U.S. adults and children have type 2 diabetes. That’s 8.3% of the population. It’s the leading cause of kidney failure, increases your risk of heart disease and blindness, and is one of the most common causes of limb amputation. Most important of all—it’s entirely preventable, and many would say curable with strict adherence to diet. The latest study, published in the International Journal of Food Science and Nutrition, sought to examine the effects of ginger consumption on lipid profile, glycemic status, and inflammatory markers associated with type 2 diabetes. The double-blind, placebo controlled study involved 70 type-2 diabetes enrolled for 12 weeks either in a ginger group or the control group. Each day, one group received 1600 mg of ginger, the equivalent of approximately ¼ of a teaspoon. What’s particularly helpful about this study is the ginger regimen is one type 2 diabetics can institute RIGHT NOW. One-quarter teaspoon of ginger can easily be put in a smoothie, meat dish, curry, salad dressing or taken in a capsule. 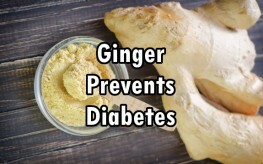 This isn’t something you need to wait on a drug for, as there has never been a reported incidence of someone harming themselves with ginger—there are no negative side effects.